no, i’m not that noble to bring about change to the school here, much less the country. this just serves as a reminder to myself to check my wallet and bring small change around just for good measure. i headed to the valor supermarket last night for 2 loaves of bread and a packet of milk. total cost, below ￥400. the only small change i had amounted to barely ￥300. so i handed a ￥10,000 note to the visibly shocked lady cashier who hesitated for a moment and asked if i was ok to go with the giant note. i said yes. to put things into perspective, that was like getting a $4 product with a $100 note. your change sir, $96. having forgotten to grab my coins and with only a ￥5,000 note in my wallet today, i had to borrow ￥1,000 from lydia so that i could get lunch. vendors here should prepare some change for people like me. we don’t change $1,000 and get 67 pieces of ￥1,000 notes. no, we don’t! we only get 65… that’s not it! 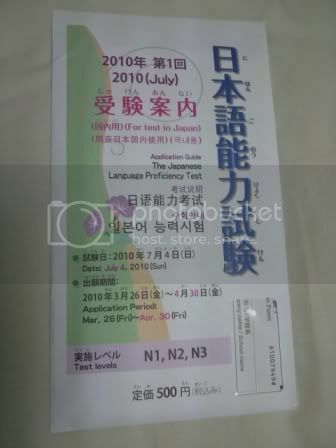 some time last year, august to be exact, i headed to jccs to get a copy of the jlpt registration form just so i can give a shot at the exam before the format officially changes. i paid $2 for the form, flew to thailand for the next 5 weeks and decided i wasn’t ready. wasn’t ready to take the exam, wasn’t ready to pay $55. today, i went to get the new format application form at our student service centre. it costs ￥500 and it’s in a very pleasant looking envelope. this is one nice envelope. i just realised it could possibly shorten my mt. fuji trip with eri. damn! we’ll see what happens come summer.